We require no less than 48 hours notice of cancellation or change in the numbers of the booking, at no charge to the booking. Failure to cancel (as above) will be charged for two nights for the booking. Tramstop Fourteen Backpackers, on Brunswick Street in the heart of Fitzroy, is a privately owned and operated hostel that offers short and long-term affordable accommodation. 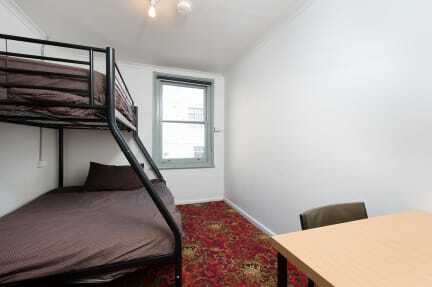 Our hostel is in a great location and all that Fitzroy and indeed Melbourne has to offer is on your doorstep. 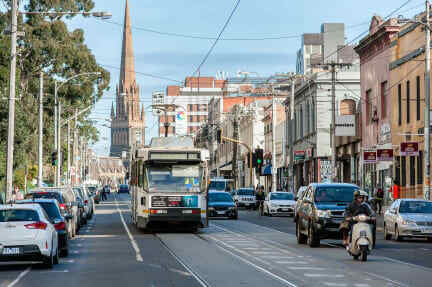 From our hostel it is only a short walk or tram ride to the best that Fitzroy and Melbourne has to offer visitors, including the iconic Melbourne Cricket Ground and Rod Laver Arena. The heritage listed Royal Exhibition Buildings and the Melbourne Museum are, literally, at the end of the street. Residents can explore Fitzroy’s multicultural background, bohemian culture and alternative communities that are well represented by great restaurants and a thriving art and live music scene. Tramstop 14 Backpackers is ideal for musicians/bands who have a gig in town and need a no-fuss place to stay. Sports fans, we are within 15 minutes walking distance of the MCG and welcome groups looking for affordable accommodation with easy access to all major sporting events in Melbourne. Our hostel is perfect for travellers who are looking for a more personal atmosphere that only a small and friendly hostel such as ours can offer, in a wonderful location, in a vibrant and exciting city like Melbourne. We have four, six and ten bed dorms, plus single and double rooms that are simple, clean and tidy. We have a fully equipped kitchen for guests who prefer to self-cater and we also provide each guest with free linen, towels and WiFi. Communal facilities are located down and upstairs. For the colder months we have a heated lounge/terrace that is ideal for relaxing with friends or fellow guests. All dorms and private rooms are fitted with air conditioning for summer and heating for winter. Tramstop Fourteen Backpackers is ideal for travellers who prefer a small and friendly hostel in a wonderful location in a vibrant and exciting cosmopolitan city like Melbourne. Tramstop 14 Backpackers is located on Brunswick Street, Fitzroy NOT on Brunswick Road, Brunswick. Was about to stay for a week, stayed for three months. Best hostel I've ever been, all residents are super friendly and welcoming, which makes it easy to make friends and stay for a while. Atmoshere is more like one big shared house, than a hostel we're nobody knows eachothers names. Plus in the best area of Melbourne! Can't wait to come back one day! Thanks Evan, Joan & Nick! Don't watch a lot of Netflix 😄 Explore Melbourne. There are a lot of long/permanent people in this hostel that can tell you where to go. Nice small hostel, would definitively stay here again. Great location near city centre, easily made friends, I stayed here for a week and really had a good time!